StartUp Health is an organization that introduced a new model for transforming health by organizing and supporting a global army of entrepreneurs they call “Health Transformers”. The organization has the world’s largest digital health portfolio with over 180 companies spanning 16 countries and 60+ cities. 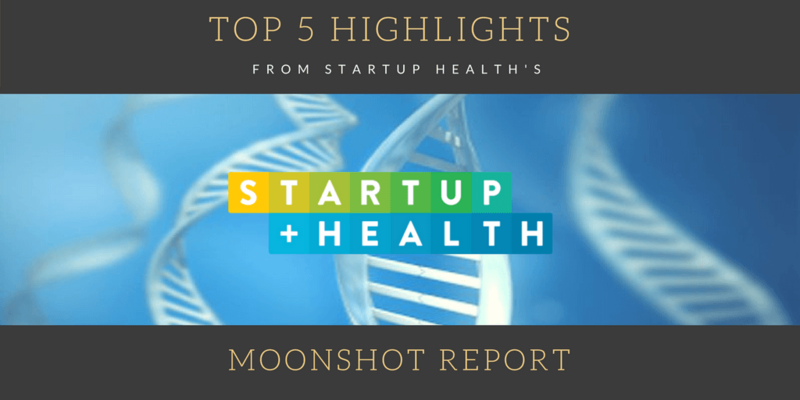 Recently, StartUp health published a report that reveals the top 10 “health moonshots” that are changing the world right now. A health moonshot is essentially a long term goal with a 25 year mission to “improve the health wellbeing of everyone in the world.” These are extremely ambitious goals and it’s undeniably inspiring to see an entity pursue them seriously. Access to Care Moonshots: Delivering quality care to everyone, regardless of location or income. Cost to Zero Moonshots: Radically reducing the cost of care by a factor of a million. Cure Disease Moonshots: Curing disease using data, technologies and personalized medicine. Women’s Health Moonshots: Prioritizing women’s health, including preventive care and new research. Children’s Health Moonshots: Ensuring every child has access to quality care, particularly in underserved areas. Nutrition and Fitness Moonshots: Providing access to a health environment and support an active lifestyle. Brain Health Moonshots: Unlocking the mysteries of the brain to improve health. Mental Health and Wellbeing Moonshots: De-stigmatizing mental health and connect mind, body and spirit. Longevity Moonshots: Adding 50 healthy years to every human life. 2016 was a monumental year for the “Moonshot Movement”. It was a record breaking year when it comes to digital health funding, with over $8 billion invested in over 500 digital health companies alone to fuel “innovation in medicine, infrastructure and consumer-driven health. Additionally more than 200 new investors entered the funding ecosystem, which puts the total amount of investors at more than 800, ranging from traditional VC and angel investor to Fortune 500 and Private Equity. 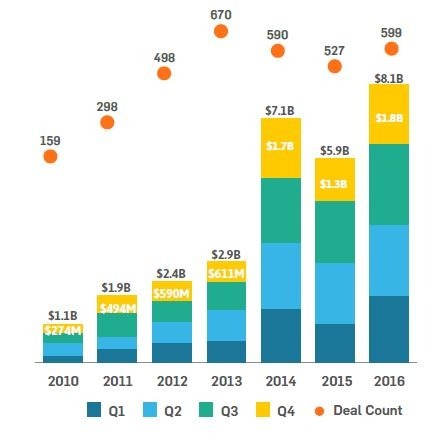 The size of deals was bigger than ever, with nearly a quarter of all funding invested into five deals. These companies receiving huge amounts of capital have bold visions and are setting out to achieve the “moonshots” laid out earlier in this article. To summarize the report’s findings: it’s been a record year for pharma, provider, and payor landscapes. According to Kimberly Muller, Director of Technology Transfer at UC innovations, we may be in the midst of a revolution. Every 50 years we see a massive revolution in healthcare and she believes that the next one is due in 2020. When you look at the amount of money that is being poured into healthcare startups, it’s clear that the industry is building towards something big. Onduo led the list as the number one deal, but was tied with Ping an Good Doctore with $500m invested. Both companies fit into the subsector of patient/consumer experience. In the case of Onduo, the most notable investor with Google, the company has been making strides particularly in the life sciences area with the inception of their new company, Verily. 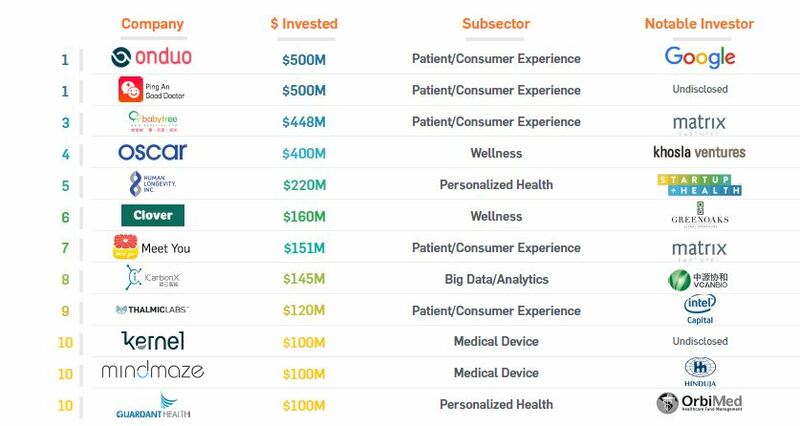 The most funded and active market of 2016 was patient.consumer experience with $2.8 billion in funding and 163 deals. 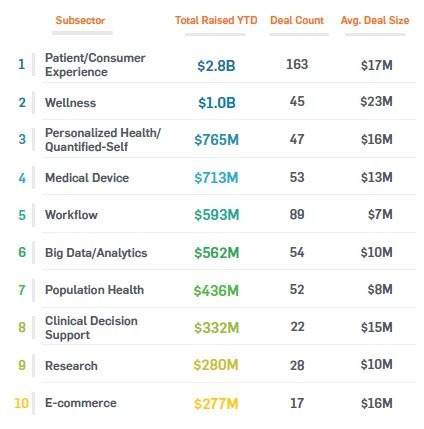 The average deal size was $17 million, followed by wellness with a solid $1 billion invested and personal health/quantified self with $765 million. Both of those areas combined saw less deals than patient/consumer experience. Check out the screenshot of the list below to get a glimpse into the rest of the most active health startup markets in 2017. Below we feature a list of the top investors in healthcare startups in 2016. Some of them are certainly familiar names, but others may surprise you. 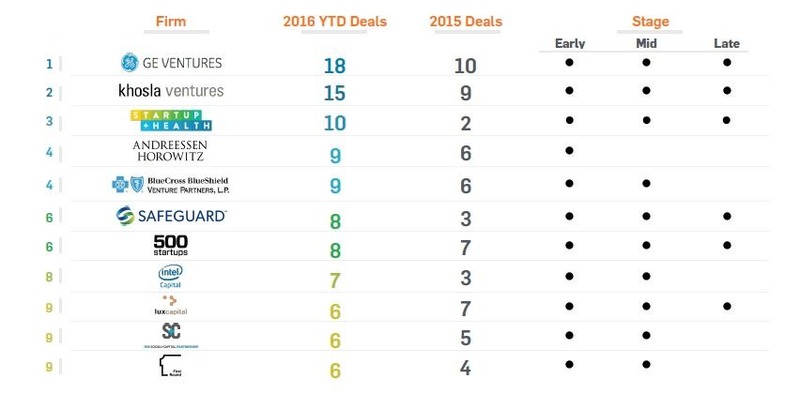 The top investor overall was GE Ventures, with 18 deals last year and 10 deals in 2015, including early, mid and late stage deals. Other top investors included familiar names like Intel Capital, BlueCross BlueShield Venture Partners, Khosla Ventures and StartupHealth. Many of these investors were tied in terms of number of deals, but some investors focused more on particular stages of investment than others. For example, Andreesen Horowitz primarily focused on early stage deals. To gain a complete understand of the outlook for healthcare startups, it would be best to read the full report, which you can find on the StartUp Health website. We’ve really only scratched the surface in this blog, as the report is in total 33 pages long. With the current trends, it’s looking like 2017 will most likely be another record year for healthcare startups and we may begin to see some of these technologies going into the mainstream as they reach late stage investment. Hopefully, these companies and StartUp Health are successful in making their ambitious moonshot goals a reality because humanity stands to greatly benefit if that happens. Stay tuned for more insights into the healthcare startup ecosystem as more reports are released and be sure to check out our previous blogs on healthcare startups to learn more about what’s going on right now. Is your organization seeking talent in the healthcare industry?